Discussion in 'Miniatures & Terrain' started by Gorkamunda, Mar 26, 2014. In an effort to follow up on @nooker's epic thread on alternative miniatures for Necromunda - here comes its green-skinned, snarling, mayhem-loving cousin. This opening post is written under the supreme guidance (OK - dictation) of Yaktribe's resident Gorkamorka Fanatikk @Flamekebab , and will be updated with user contributions. This first draft of the opening post will only contain suggestions for the four factions from the original release and the expansion pack Digganob - Orks, Diggas, Rebel Grots and Muties. I will later add options for factions published in magazines and contributed by fans. 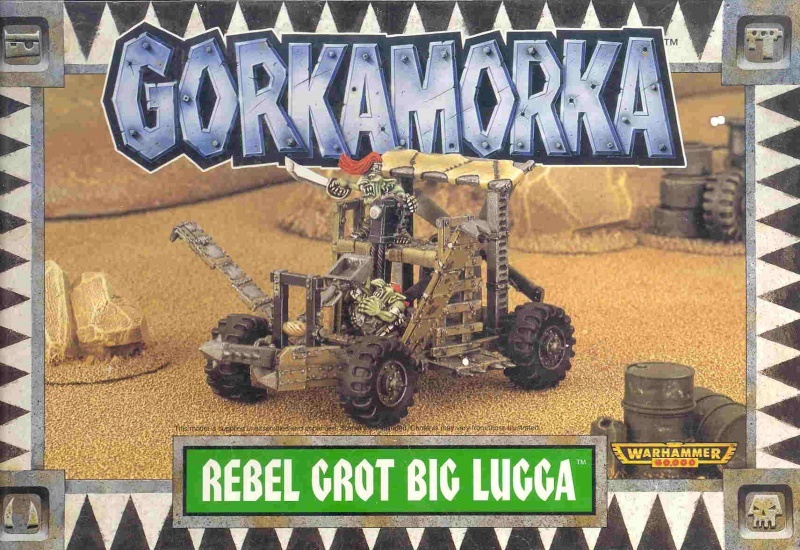 This thread will differ slightly from @nookers thread, in that it will also encompass Gorkamorka specific bits, seeing as there is a limited supply of bits fitting some of the factions. And some of the factions will require some conversions/kitbashing to get on the table. It will also be listed by factions (rather than manufacturers), unlike the original thread. This will hopefully make it easy to find specific models/bits you're looking for for your faction. If you wish to quickly find a suitable model or bit for your needs, @Flamekebab has made this utterly awesome and detailed list over on reddit for you to feast your eye on. The original model range is very well executed (at least in my opinion), but is long out of print. Models from this range are quite easy to get a hold of on ebay, though, and they are more reasonably priced than those of Necromunda. Even so, there are ways of getting a mob together that doesn't involve stepping down the time-consuming and sometimes treacherous path that is ebay. The options for the Orky Gorkamorka player seems almost endless. There are several miniatures makers that will supply you with everything you need in one place, both models with different weapons options and vehicles. There are also a lot of manufacturers that make great bits to diversify your Orks, so making a unique mob is easier than ever! Games Workshop: Wait, what? Alternative? Well, Games Workshop might not be seen much like an alternative force on the miniatures market, but they do currently produce miniatures that work well for Gorkamorka - straight out of the box. In the current Warhammer 40.000 range of Orks, there are plenty of options for those who just want to order a box or three and start playing. The Ork Boyz should be your first pick, and they include both close combat and basic weapon options (be advised that heavy weapons, unlike in Necromunda, are only for mounting on vehicles - because dey's so 'uge). You can even buy this handy 4-pack if you only need a few. Oh, and Games Workshop has those really big Nobs as well (that didn't sound right, did it?). If you feel like including those delicou... err, disgusting Gretchin in your mob, then you should get a box of - you guessed it - Gretchin. Rundtherd (Slaver) included! The really great thing about GW's Ork range is that it still offers options for all the regular Gorkamorka Ork rides, namely Trukks (which are more or less mainstay in a starting Ork mob), Bikes, Traks and Buggies. 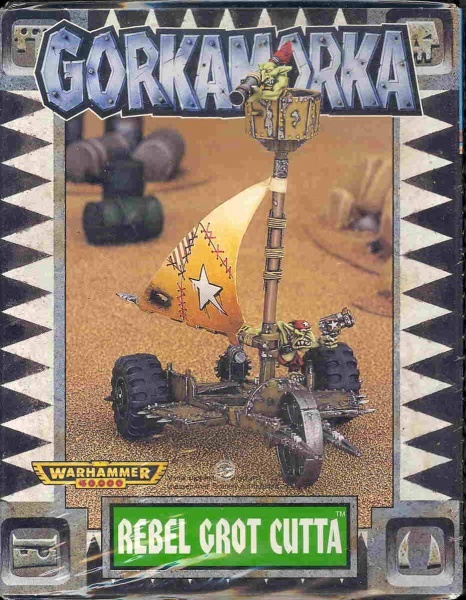 They even sell the very same model (Deffkopta) that back in the day was originally released as the Gorkamorka special character Dregmek Blitzkart. If you want to score some boyz alongside a truck, the Truck Boyz will suit you nicely. The Elites, HQ and Heavy Support sections of the army will also offer some interesting (and expensive) ways of diversifying your mob, though they might require a bit of modification. Kromlech is an excellent option for any fan of the color green, and you could easily field a great mob using only their products. They produce high quality resin products (@Gorkamunda approved), that they sell through their ebay store. Most of their business is based on bits, but they also sell the odd complete miniature. They have heads in a staggering variety of styles, arms, legs (kneeling, running and regular), torsos and those ever-precious bionics. In addition to this they make a Trak and a Buggy (both really nice), some vehicle accesories, and loads and loads more! Kromlech really is one of the best places to visit for most of your Gorkamorka needs. Spellcrow is another great place to score some Ork-specific bit. Their Ork section is stacked with heads, torsos, legs, arms and weapons - and they also carry some bionics. They have arms for two-handed weapons operation, which is great. There are few complete miniatures here, though. The only thing preventing this from being a one-stop-shop for your Ork mob is the lack of vehicles. Puppets War is another site that is very close to being able to fulfill any needs a Gorkamorka player might have. They already have some cool heads (gringo ork heads ftw!) and some very unique options for Ork vehicles - including a killer Trukk and Buggy. And what self-respecting Ork would ever have a fiesta without this great-looking party pack that includes molotov coctails, revolvers and maracas? By the looks of it, they will soon launch more orky stuff, so we will definitely keep an eye on Puppets War in the future. Forgeworld is Games Workshop's way awesome'r (but highly expensive) nephew. They make high quality (nowadays, at least) resin/plastic products. They produce many of the same units that GW does, but their's have a way of looking, well, much cooler. In their range they have several vehicles that would look absolutely stunning in an Ork mob, namely their Trukk, Big Trakk, Halftrakk and Warbike Nobz. Basicks also has a few items of interest for the Ork player. Their range consists of a few heads and bodies (regular + biker), that will give your mob a WWII military look. A bit disappointing that they don't have arms for their bodies, but the items they have do look like they're of high quality. Maxmini provides a couple of high quality options in their Orks section, but you will far from complete your Ork mob by placing an order here. They do have some cool heads (like everyone and their mother! ), and you could create a unique looking biker mob from their Badass Orc Biker (fitting name indeed) and their Renegade Orc Bikers. Fox Box is @Flamekebab's own shop, where he in addition to Orky bits from companies already on this list, also sells his own marvellous creations! Especially cool is his Ork Trukk Extension Kit, which will make your GW Trukk look way cooler, and it will probably go alot fasta as well (at least if you paint it red). I've never seen Ork Riot Shields (complete with arms) for sale before, and must admit that I am intrigued! Ramshackle Games are rumoured to have some items for Ork mobs, but their web store is currently closed. We will get back to that when they re-open. In addition to this, Zinge Industries makes some nice weapon sprues suitably sized for Orks. The Diggas are decendants of an Imperial surveying team that was doing excavations on Angelis when the giant Ork space hulk crashed on the planet. Rules for Diggas can be found in the Digganob expansion, which you will find in the Yaktribe Vault. Diggas may be represented by a variety of feral/tribal/scavenger type of miniatures. If you're an avid fan/player/collector of GW's Necromunda (who isn't? ), you might already have a sizeable Ratskin Renegade gang amongst your miniatures, and these would be excellent choices for a Digga mob. They have many of the same weapon options, and both have/use a Shaman model. Another suitable Necromunda gang are the Goliaths - but you would have to convert a suitable Shaman model and some weapons. There are other options for complete miniatures as well. Native American models, like these Woodland Indians from Conquest Miniatures will work well, though they will require extensive weapon swaps. Privateer Press has their own take on the Native American style, through their Idrian Skirmishers (here, here and here) which are well suited to represent Diggas. If you prefer more of a Mad Max-feel to your Diggas, EM4's Scavengers and Future Savages (here and here) might be of interest. If you wish to kitbash Diggas from different plastic sprues, basing them on GW's Chaos Marauders and mixing it with the "usual suspects" (Empire Free Company and Catachan Jungle Fighters) and your bit box might work. They would be a bit bulkier than the original models and the complete miniature options listed above - but the Diggas idolize and mimic the Orks of Gorkamorka, so it could well be explained fluff wize. Besides, they wouldn't look off next to modern Ork models. Diggas use the same vehicles as their Ork superiors. For suggestions please see the Ork section of this guide. The only problem you will encounter is finding human drivers for the vehicles. Ramshackle Games are rumoured to have some human 28mm drivers, but their store is currently down. We will get back to this when they re-open. Rebel Grots are the brave Gretchin that have stood up to their Ork masters. They have relocated to a part of Angelis called The Skid, from where they wage guerilla war under the banner of The Gretchin Revolutionary Committee. Rules for Rebel Grots can be found in the Digganob expansion, which you will find in the Yaktribe Vault. The most obvious option for fielding Rebel Grots would of course be GW's Gretchin box. These models are clearly based off the Gretchin sculpts from Gorkamorka, and works great alongside the original models. If you're looking for some extra heads , their WHFB Goblin Wolf Riders have heads that are a good match to the originals. Many bits shops have these stocked. Something that clearly is popular amongst miniature makers (and fits with the fluff context of the Rebel Grots of Gorkamorka), are communist/soviet grots. Between Kromlech's Soviet Goblins Squad, Basicks' Goblin Soviet Troopers and Generals, their Soviet Goblin Heads (here and here) and a box of GW Gretchin, you'll find yourself expropriating Mektown in no time! Maxmini produces one single Gretchin miniature, The Mean Green Gobbo, which is excellent, but a bit scrawnier than GW's line of Gretchin. You can see a comparison here. The same company produces these pirate Gretchin heads, which are well suited for head-swapping said GW Grots (and a mix of GW and Maxmini heads is a good match). Vehicles for Rebel Grots will in most cases require some scratchbuilding/kitbashing. The Big Lugga could be based off most medium(+) sized vehicle chassis', like the Ork Trukk or even the Buggy. It's only your own imagination that will limit you. For instant awesomeness, see here and here (last one courtesy of @Flamekebab). For reproducing the Cuttas, Aberrant Games' Warlands Sand Surfers (here and here), might offer an interesting solution. Yes - they are 20mm scale - but seeing as Gretchin are only about yea high, it actually might work. It will require some minor expansion of the Cuttas' floor space (which should be fairly easy with some small pieces of plasticard). If anyone has one of these and would be willing to scale it with a Gretchin on board - please do so and send pics. Lots of pics! Muties (or Mutie Raiders) are by far the most outlandish of the four main factions of Gorkamorka - mutated humanoids riding hellish steeds and wielding exotic weaponry. Fielding a Mutie Raiding Party without using the original Gorkamorka models isn't the easiest option when looking to play Gorkamorka, but with some fairly simple conversions you will soon be ambushing everyone that might be venturing this far out in the desert. Rules for Muties can be found in the Digganob expansion, which you will find in the Yaktribe Vault. Your best bet would be to use Games Workshop's Seekers of Slaanesh or perhaps Hellriders of Slaanesh as a base for conversion, and swap the heads and weapons (and if you don't like the female look of the Seekers - the torsos). There's an excellent conversion guide over on gorkamorka.co.uk, which utilises Kroot bits in addition to Seekers of Slaanesh. There are other options for conversion bits than GW's Kroot range, though. Pig Iron Productions have some nicely mutated heads, and these heads from Puppets War are also really well executed (and a bit easier to work with, seeing as they're made from resin). Kromlech has melee weapons well suited for a Mutie sorted (namely here, here, here and here), and Maxmini also makes a set of Mutie hand-to-hand options, in addition to these rifles and this set of mutations. These calivers from Forge World should make your armoury pretty complete. And if you want to pimp out your raiders with some exquisite mutations, Maxmini has those . The heads on GW's Chaos Mutations sprue will also work well. djmothra, Paupoi and Flamekebab like this. Both are a cheap way to get into GorkaMorka. The vehicles would make good permanent additions to a mob, but the flats really should only be used as proxies until something better comes along. The Necromunda flats would do well for Diggas as a sort term solution. Although, I think I'll use the Ash Wastes Shaman instead of the Telepath as he would fit better. http://zinge.co.uk/index.php?route=product/category&path=18 - whole load of vehicle accessories, including wheels and tracks. Fancy just having one extra long truck to carry all teh boyz... http://northstarfigures.com/list.php?man=154&page=1 and lots more potential conversions, steampunk tanks - may want to remove the guns though. adlard.matthew, Ben_S, nooker and 1 other person like this. Some other Orky bits: Circle blade weapon, and separate buzz saw wheel. Oh and mini turrets. I've updated the Gorkamorka model list with Ramshackle's stuff. I've not gone through Mantic's stuff yet, perhaps I'll have time this weekend but I've got to catch a train into London in a little bit so concentrating on anything is kinda hard! I'll update the the links in the opening post, as well as make a few additions based on the feedback here... Keep it coming! You can get it here. He's got several other good terrain things that would work well, but this is definitely the best. And then there's armorcast: http://www.armorcast.com/ Sort of cool if you;re into that old school feel. These are quite cool for example, just a shame that they don't have any high quality photos. Whilst it looks nice I'm not really sure what Curtis needs a Kickstarter campaign for. I can see it being a handy way of shifting the costs certainly, very savvy business sense, but when it looks like the product is already completed it seems a bit odd! Well, there are production costs of course. I think he had a bunch made to paint up as a promotional thing (marketing costs), but in order to produce enough of them, pay back the moulds, etc. he might needed a Kickstarter. I know Troll Forged Miniatures are also looking into a sort of similar models in which they'll run small member Kickstarters to finance the production of sculpts done by members. Not sure how it'll go though since it's very much on a drawingtable still. I guess in my fairly limited experience with Kickstarter projects have always asked for money earlier in the process. If this sort of thing works though I might have to give it a go myself. My Orc humvee isn't going to cast itself!